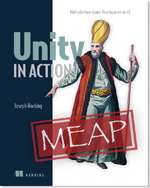 There’s a new Manning book MEAP for Unity in Action and you can get 50% w/ the code mlhocking. Go to manning.com to order. I have my copy and can’t wait to dive in! This entry was posted in Game Dev, iOS Development Book and tagged book, gamedev, meap, unity. Bookmark the permalink.